National Association of Black Women in Construction, South Florida Chapter, Inc. Presents Industry Day 2016! 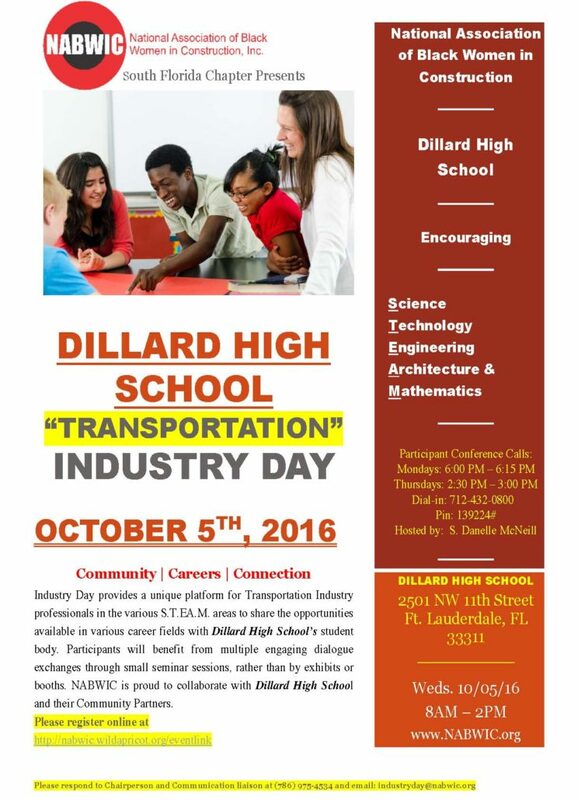 Industry Day provides a platform for Industry professionals to share with students the opportunities available in various S.T.E.A.M. career fields of the transportation sectors. Industry Day differs from a traditional career fair by offering information through small seminars with dialogue exchange, rather than by exhibits or booths. The event is hosted by the National Association of Black Women in Construction (NABWIC)–South Florida Chapter local sponsors in collaboration with the Dillard High School Partners. 1. To give students exposure to role models and possible careers they can consider as well as offering new career choices. 2. To show the connection between school and real life; how presenters used their education to achieve their goals. 3. To emphasize careers in STEM (science, technology, engineering and mathematics) and other areas of transportation, aviation, construction and engineering. 4. To provide students an opportunity to interact with professionals.